Laurie, your photos are so gorgeous! And I'm also in LOVE with those plates! I've been on the lookout for some cute, simple white plates. kaycie, thanks so much! those plates are actually part of our wedding china. i love them because they are simple, yet elegant, and they go with everything. they are made by lenox and the pattern is called "opal innocence carved." 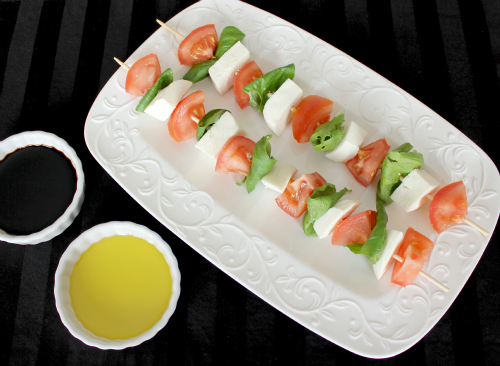 the plate that has the caprese salad skewers on it in the pictures is the hors d'oeuvres tray. we have many other shapes and sizes of the dishes in this set, and i frequently show them in pictures of food on the blog. we got ours at macy's but lenox is sold at many other stores as well as online. 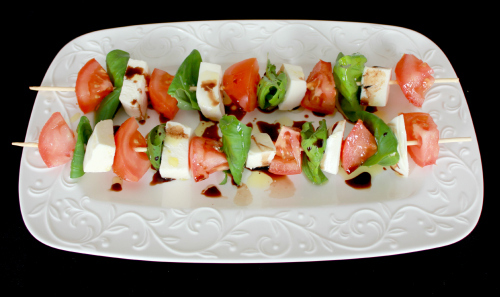 Clever idea to make the tomato, mozzarella, and basil into skewers. I had the Arugula, tomato, mozzarella, and pesto on the big boat twice. That was good.